Reflections on the Joyful Mysteries is the subtitle of Tales of Grace. This needs some explanation for non-Catholics and many Catholics alike, since it refers to the recitation of the Rosary, which is a series of standard prayers said in a certain order, guided by rosary beads, to help a person meditate to find solace from emotional pain or the discomfort that comes from the repentance of their sins. The purpose of the Rosary is to help keep in memory certain principal events or mysteries in the history of our salvation, and to thank and praise God for them. The author wrote this book to represents his meditative imaginings while saying the Rosary and reflecting on five of twenty biblical events Catholics are taught to reflect upon while saying the Rosary. In his case, the author/narrator thought about the five events that are called the Joyful Mysteries. The How to Pray the Rosary website has this page with more detail about each of the Joyful Mysteries. 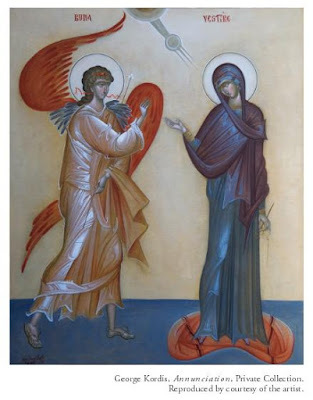 Here is a link to an on-line reference that quotes the Biblical sources for each of the Joyful Mysteries, The Holy Rosary. This site offers rosary prayers in many different languages, along with inspiration and lots of information. The Italian author of this book was also a poet, and his prose often reads like prose poetry written in a stream of consciousness style following the meanderings of his mind while meditating through prayer. The translation is faithful to the original, keeping the author's fresh, intelligent narrative voice. Just to be clear, saying the Rosary is a form of meditation through prayer. During the recitation of the prayers, the supplicant is encouraged to imagine himself in the scene of the mystery or a similar scene, in order to feel closer to the Holy Family. That is just what the author does in the chapters of Tales of Grace, which are named for the Joyful Mysteries. The reader of this book can share the author's imaginings as he says the Rosary, and thus get a feeling of greater closeness to the scriptural events. The reader can also enjoy the author's creative associations linking the past to the present, which offer some intelligent reflections on how we celebrate our faith today. I enjoyed this intelligent, creative book very much, and I hope the faithful among you might enjoy it too, or consider giving it as a gift to a faithful friend or family member who enjoys imaginative prose. This very attractive book would make a beautiful gift. Joyful Mystery #1 - The Annunciation - The angel Gabriel announces to Mary in Mary's home in Nazareth that she will bear Jesus. The first chapter of Tales of Grace is headed Loreto, which is a town in Italy where the purported House of Mary is located. I'm talking about the actual house where Mary, the mother of Jesus, grew up, lived in when married and after her son's death, and where the apostles set up a church to say mass after Jesus was Risen and the new faith was born. It is also the location of the actual Biblical annunciation, for the many faithful who make pilgrimages to it each year. For more about Santuario Loreto, you can visit their website, but briefly, either archangels brought the house out of the Holy Land which was overrun by Muslims who were destroying many Catholic shrines, or a crusader named Angelos moved the house to keep it safe from destruction. 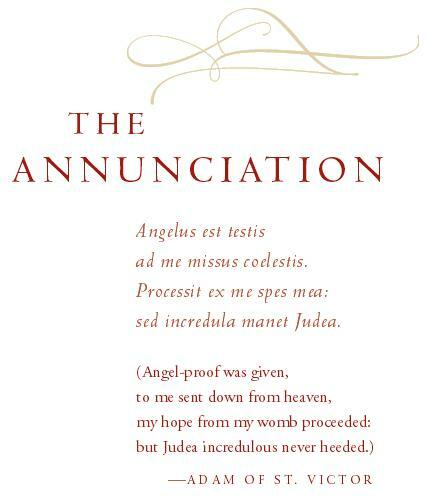 The narrator, while saying his Rosary and reflecting on the Annunciation, imagines he is at the House of Mary where the annunciation took place, on Easter Sunday taking a tour of the sanctuary. He imagines that he manages to remain in the house after the tour group leaves, so he can say a Hail Mary prayer alone by the altar that is in the house. 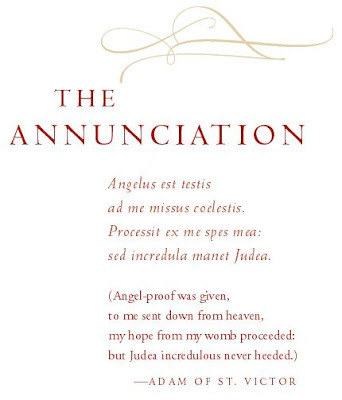 His prayer calls forth an archangel who chides him for forgetting to do his penance after confession that morning. They agree that the man can say a Hail Mary instead. The narrator, however, takes a moment to ruminate on what life as an angel must be like. Then he asks the angel to explain how the House of Mary came to be in Loreto, which the angel does. I thought the most lovely moment of the ruminations were when the narrator decides that the use in much of the world of the Vatican's year-counting, beginning at the year estimated to be of the year the Christ child was born, is in itself a form of reverence, even if so many people are no longer among the faithful. ...more and more humans forget you (or live as if they have forgotten you), but keep counting the years since your first coming...so you are with us on every page, in every human interaction. Joyful Mystery #2 - The Visitation - Mary goes to visit her much older cousin Elizabeth who is pregnant with John the Baptist in a town south of Jerusalem, Ein Karim. The longest chapter in Tales of Grace is the one recounting the narrator's ruminations while saying his Rosary and contemplating Mary's visit to her cousin Elizabeth before both women have their children. He manages to place himself in the story in the person of a stable boy who is hired to milk the animals for Elizabeth and her husband, Zechariah. ...the irreplaceable béchamel that holds together all the neighborhood's "casseroles": engagements, dressings for the dead, bridal trousseaus, sprained ankles, and so on. Within this chapter we hear Elizabeth's story of her late pregnancy with a child who will become John the Baptist. We also hear Zechariah's story of how he doubted the archangel who told him he would be a father, and for his punishment for his disbelief was made mute during the pregnancy. The second half of the chapter is from the point of view of the stable boy, who instinctively worships Mary, who teaches him a lesson about men and women and their tendency for deceit. Joyful Mystery #3 - The Nativity - The birth of Jesus in Bethlehem. The chapter in which the narrator is saying the Rosary and ruminating on the birth of Jesus is the chapter in which the author infuses the most critique, albeit gentle critique, of his fellow Christians. It is hard to argue with the author when he reflects that we too often celebrate the birth of Jesus by gorging ourselves and giving and expecting expensive gifts. The creative, highly imaginative satire the author creates is centered on a Christmas banquet attended by a strange assortment of guests who include gluttons from history, the three Magi, and others involved in Jesus's birth, life and death. Pilot, Harod, and Judas, for example, are there, each with telling details attached to them. ...Jesus Christ is a man who came in the world to let us have a big feast at Christmas. There is much about the banquet scene that is reminiscent of Absurdist Theatre, which was very popular at the time Tales of Grace was written. When the stable boy disguises himself as a Roman soldier, he witnesses the banquet, then goes to warn the Holy Family that Harod is about to launch the Massacre of the Innocents. The absurdist story then merges with the narrator's childhood, reversing back to when he was a baby, and he imagines that he is like the baby Jesus, suckled at the breast of Mary. He shows in that one swift sequence how Jesus was born as a human child to a human mother, just as the narrator and all of us were. The difference is that Jesus is also divine, and Mary is holy. Joyful Mystery #4 - The Presentation - Mary and Joseph brought Jesus to be blessed in the temple in Jerusalem, where they heard a prophesy by Simeon about Jesus's future. I found this chapter, the briefest, the most poignant. The protagonist the narrator imagines while saying his Rosary and reflecting on this mystery is a church sacristan, a man who assists the priest in the sacristy to prepare for communal masses and other sacraments, someone you could say is comparable to Simeon. The man loves churches not just for their communal nature and art. He values them because they are home to rituals that are salves for our souls, and as such churches are the closest to heaven as we can get on this earth. The sacristan especially loves the churches of Rome, so many of which are linked to the fathers of the church and the earliest martyrs, giving them extra weight. ...you, churches of Rome, with your breadth reproducing the archetypal breath of God. The touchingly devout man has a kind heart, which leads to a miraculous encounter in his church at the end of the chapter. Joyful Mystery #5 - The Finding of Jesus at the Temple - When Jesus was 12 years old, and the Holy Family took their yearly trip to Jerusalem for Passover, Jesus went to discuss theology with the priests in the temple. The man saying the Rosary contemplates Jesus teaching the rabbis in the temple of Jerusalem, and that leads him to imagine a comparable situation today. Since one doesn't discuss dogma and church practices in churches these days, the narrator returns to discuss these things with his old professors, all priests, at his Catholic boarding school. Grace is about finding more pleasure in avoiding sin than committing it. The priests are not open to this message, preferring to lament the state of the church and put the blame firmly on the fallen Catholics. Interestingly, Evangelical Protestants have gained many followers in Latin America just for their stress on joyfulness in their services and their communities. One could say the author foretold this. The chapter, the last in the book, ends when the narrator finishes saying his Rosary while reflecting on the five Joyful Mysteries. 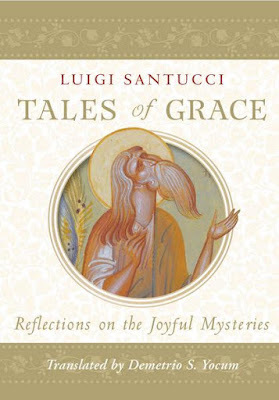 Paraclete Press provides this About the Author information for the late Luigi Santucci, a renowned Catholic author from Milan, Italy, the author of Tales of Grace. Luigi Santucci (1918-99) was one of the most important Italian writers and poets of the twentieth century. He worked at the Catholic University of Milan until 1944, when Santucci took refuge in Switzerland because of his opposition to the fascist regime. Actively involved in the Italian Resistance, he was one of the co-founders of the underground newspaper L’Uomo, with poet David Maria Turoldo. Among his books translated into English are Meeting Jesus – A New Way to Christ (Herder & Herder, 1971), one of the most original treatments of the life of Christ written in the twentieth century, and Orfeo in Paradise (Knopf, 1969). This compelling and charming book employs story and whimsy, with delicate, lyrical touches, so that readers can experience in new light the joyful mysteries of the Rosary. Translated for the first time into English, the great Italian writer's poetic, original vision helps readers rediscover the tenderness and beauty in the miracle of Jesus’s birth and childhood, beginning with his conception, and concluding with his adolescence. Thank you, Suzana! I'll add the site link to the the references paragraph in the review. I especially like all the languages the site offers. Wonderful!